I was young and naive then. Having learned this fascinating subject known as C programming, I read anything I could about programming. As a game enthusiast, I pored over articles and tricks on getting the computer to perform neat and cool stuff. to multiply by 8 as I could save a few processor cycles. so I could save the use of a temporary variable. Or counting down so I could compare against zero in a for loop's condition part. Which was supposedly more efficient than counting upwards, and having to compare against a nonzero value. I can't remember when, but at some point in time, I decided that I've been restricting myself. Obsessed with faster clock cycles, smaller memory footprints and elaborate coding structures, I had taken away the freedom to create a working program the way it needs to be. I became an optimisation slave. But what about demo sceners? Aren't they coding against unnecessary limits? In the past, programmers optimise out of necessity. Demo sceners optimise as a form of programming challenge. Although nowadays, there are contests (such as in Breakpoint) where full blown demos weigh in megabytes. With better computing architecture, richer textures, fuller sounds and more detailed 3D models are used. Speaking of 3D models, I remember writing a custom geometric shape generator. There were functions for generating spheres, cubes and tetrahedrons, complete with texture mapping capabilities. I was obsessing over the number of polygons produced, trying to figure out the least number of vertices so that frame rate wasn't affected. "But don't you need to find out what the limits are?" you ask. "If you plan and optimise from the start, then you won't hit those nasty problems." Let me introduce you to the math concept of local and global maxima. 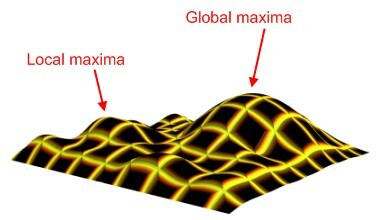 A maxima is a point of maximum value. If you optimise from the start without regards to the whole, then you gain local maxima, high efficiency relative to the little amount of code you wrote. But if you wait till closer to the end, where you have already solved the given problem, then you have a better idea of the code structure. This is where your optimisation efforts create the most benefits. You get global maxima effect. It’s kind of like my way of writing an article. Write down all you want to say, and then begin to edit what you’ve done. There’s no point in trying to optimize a program, if there’s no useful program there to optimize! Your example of writing articles is an excellent one. Finish writing, then edit. Finish coding, then optimise. Thanks! Definitely enjoyed that article, and I agree, code first (with decent optimization) then rework it later! Otherwise you never get anything done! That’s right, you should code with decent optimisation. It’s when someone codes while optimising to the exclusion of everything else that’s dangerous.